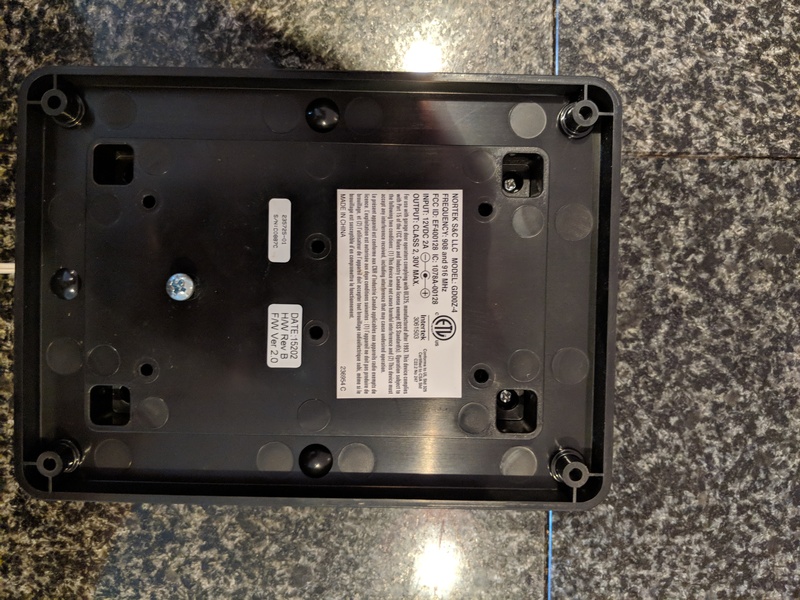 So after 2 years, my z-wave garage door opener bit the dust. I’m a little disappointed because I really feel like it should have lasted longer. As I wait for the other one to arrive, I decided it would be fun to start pulling apart the existing on (it’s broken, right?). I should note that when I say “broken” I mean that it will no longer lift and lower the associated garage door. The system continues to generate beeps, but the LED never flashes and the door fails to open. Most of my research into the forums seem to indicate this is a common problem and the only resolution is to have the vendor send you a replacement one (so far, I think that’s still probably the best path). 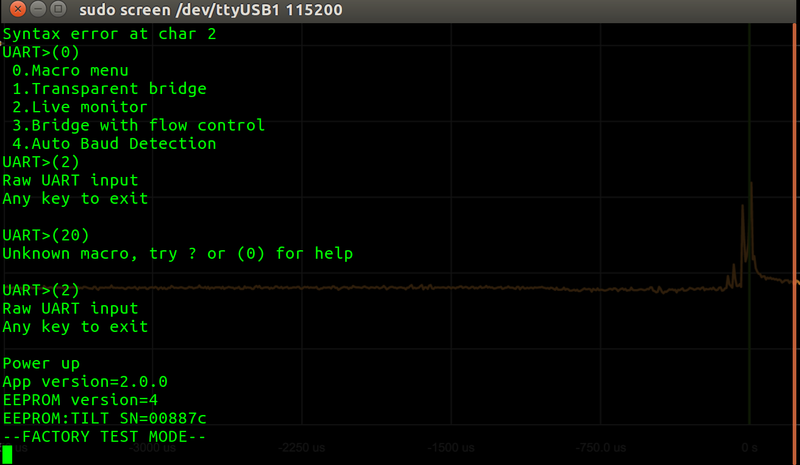 My interest is instantly drawn to the SENSOR UART pins (populated!!!) as a first place to go. 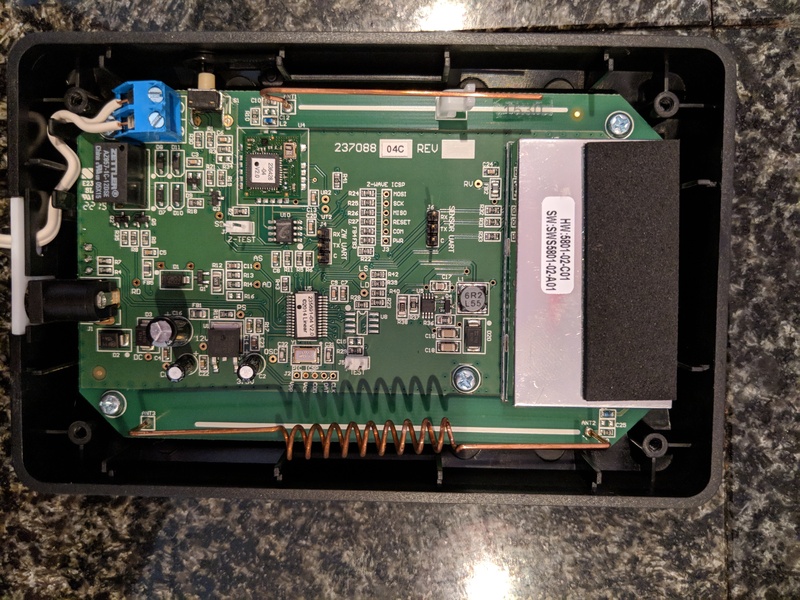 If you’ve ever read anything from Embedded Device Hacking, many hardware manufactures will attach associated serial ports to these sytems for testing and debugging access. It appears the same is true for this manufacture. No such luck … nothing back, no luck with auto baudrate detection … nothing. So it was time to break out the scope. I’ve had an OpenScope MZ that’s been begging to cut it’s teeth on something so put the oscillicope on the TX pin and futzed with trying to get something (anything really) out of the system for an hour or so with no luck. It was about this time I noticed that my red power LED was no longer working and I couldn’t seem to deterime why (everything else seemed to have power on the board). Sadly, test mode is boring and basically just a continual loop of doing the above things. I should note that I’m not 100% certain of the accuracy of the above output - but if it’s right, it would clearly explain why my controller doesn’t work in any useful fashion. Another interesting note is the R345 RECEIVER INTERFACE listed. 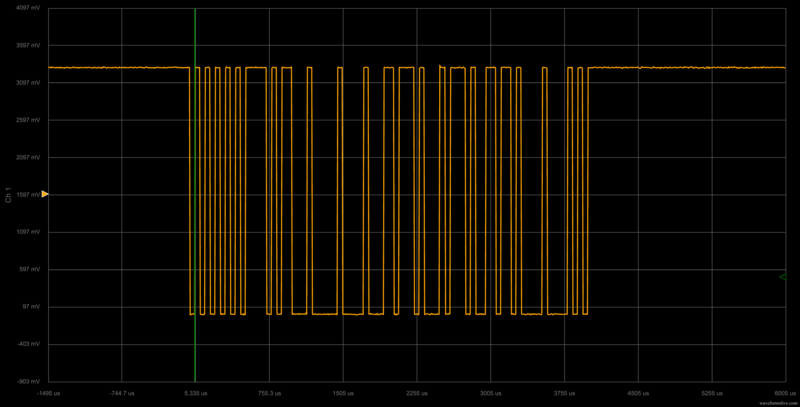 I’d venture a guess that this is the communication between the controller and the door open/close sensor. Application firmware by Siva Kathan, Martin Mucciarone, and Mi Jin Park. Z-Wave firmware by Steve Boyle. The “firmware by” line is only printed after holding the associated button on the board for about 10 seconds and then releasing once you get to a series of beeps that follow in a row. I also tried putting the BP in transparent bridge mode to see if there was any way to interact with the system, but sadly, it does not appear that there is a direct method of input at this point in time. 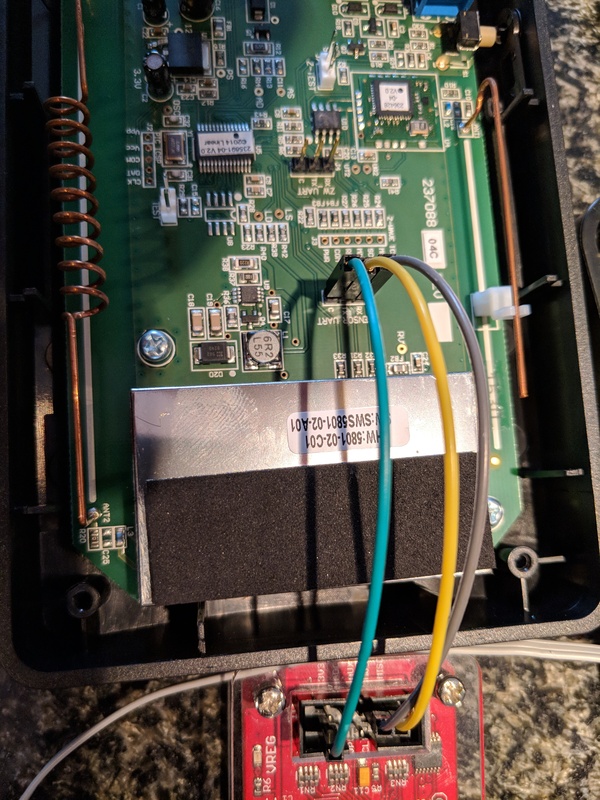 I’ve considered pulling off the associated firmware images via the ICSP headers (there’s one for PIC and one for Z-WAVE), but that will be an exercise for a later date since this damn thing keeps beeping and there’s only so much I can stand. I finally got enough time to get to actually play with my Malduino Elite which is a pretty sweet open source USB rubber duck. After dorking around with the base code as well as the Hack A Day code, I wanted to know what else I could do with those expansion pins. I recently picked up an Adafruit Feather HUZZAH with the intent of gluing it together with the SmartThings eco system. This presented an initial problem of needing to do SSDP based communications since that's how SmartThings likes to do LAN based communications. After digging a bit, it becamse clear I was going to have to make some modifications to the library. Well, the time has finally arrived that I am going to ditch Wordpress. Wordpress has just become too much of a headache anymore for just maintaining a place where I can complain about things or keep technical notes for myself and I’m no longer interested in having to fight the security beast; I’ll leave that to the young guns at github.io. My hope is that this will encourage me to get back into documenting my escapades since the last posts have always just been because I was updating Wordpress to prevent some new hack. Today I’m releasing my “first” android application into the store. I say first because it’s not the first I’ve written, but it’s the first one that I’ve actually decided might actually be slightly beneficial to someone else so I put it into the store. When the app goes live, I’ll add a link and all that other fun stuff. In the mean time, you can check out details about what the app can / can’t do and the things I learned along the way here. I recently picked up a veho Muvi K-Series action camera … and the application on Android didn’t work for anything. So I started down my own path. Due to the fact that the camera’s quality was kind of terrible (random blocks of video would just jump in and out) and the SD card that was shipped with it was broken and wouldn’t function in anything, I decided to send it back. But I’ve collected all of my comments, code, research, etc. into the muvi_kseries_research repository for anyone else that would like to poke, prod, or build their own application for whatever reason. Enjoy and let me know if you found anything helpful. So yes … apparently this is the best we can do with the zlib library.